At the invitation of FRONT International: Cleveland Triennial for Contemporary Art, New York-based artist Barbara Bloom has created a work specifically for the Ellen Johnson Gallery, on view July 14 through December 16. Designed by the influential postmodern architect Robert Venturi in the 1970s, the gallery is far from a neutral white cube. 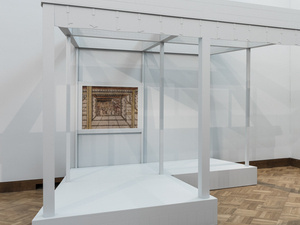 Rather than ignore the gallery’s eccentricities, Bloom has chosen to accentuate them through a selection of works from the museum's collection, all of which depict architecture in some form. The works are shown using a variety of display devices that allow the viewer to navigate the space architecturally, and to experience these works as though they are willing themselves off of the two-dimensional plane and into space. This project was commissioned by FRONT and organized by Andrea Gyorody, Ellen Johnson ’33 Assistant Curator of Modern and Contemporary Art. THE RENDERING is presented with support from the Eric and Jane Nord Family Fund and the Nord Family Foundation.